With the San Francisco Bay Area being home to some of the hottest technology connecting our world, one could easily get in the habit of feeling more connected to “the internet of things” than the natural and living things all around us. But, from insects to plants to birds and humans, buildOn students are learning we are all connected–putting down their devices, rolling up their sleeves and getting their hands dirty to protect Mother Earth. Bay Area youth from June Jordan School For Equity, Leadership High School, and Mission High School put buildOn’s mission into action by cleaning up area beaches, increasing food security with our friends at Alemany Farm, planting healthy, organic food for community members, restoring hiking trails, and promoting the walking and cycling in the community. 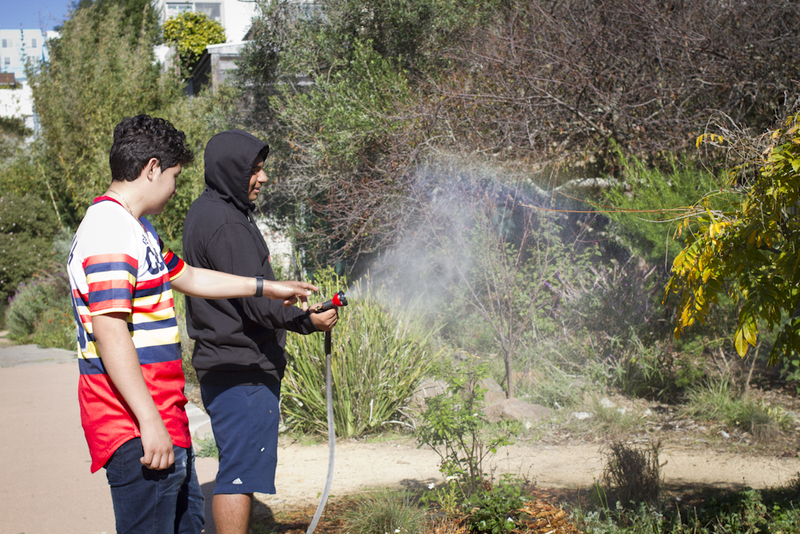 Watering plants at San Francisco’s Visitacion Valley Greenway garden is just one of the ways buildOn students are creating a greener–and stronger–Bay Area Community. 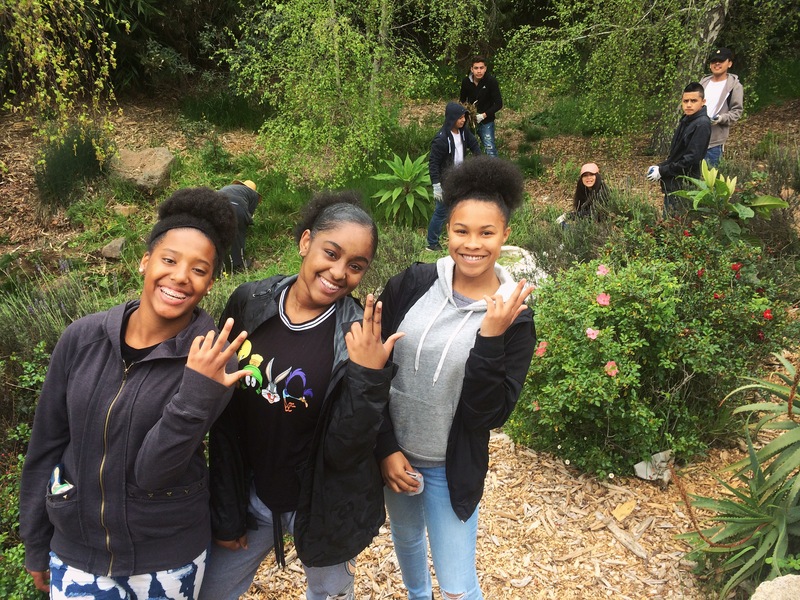 By far, one of the most meaningful environmental service projects our students have participated in is beautifying their community at San Francisco’s Visitacion Valley Greenway garden, a six-block stretch of green space and local gem. Since 2010, buildOn has partnered with Visitacion Valley Greenway to make a positive impact in the community. The Greenway’s founders Fran and Jim, are the sweetest, sharpest elderly couple you will ever meet. For years, they have educated youth in the community about horticulture, environmental issues and advocacy. Their mission is to build a sense of vibrant community and empowerment for the Valley’s culturally diverse residents, providing personal growth, and a healthier environment along the way. buildOn brings students from three different San Francisco high schools here to volunteer once a month. 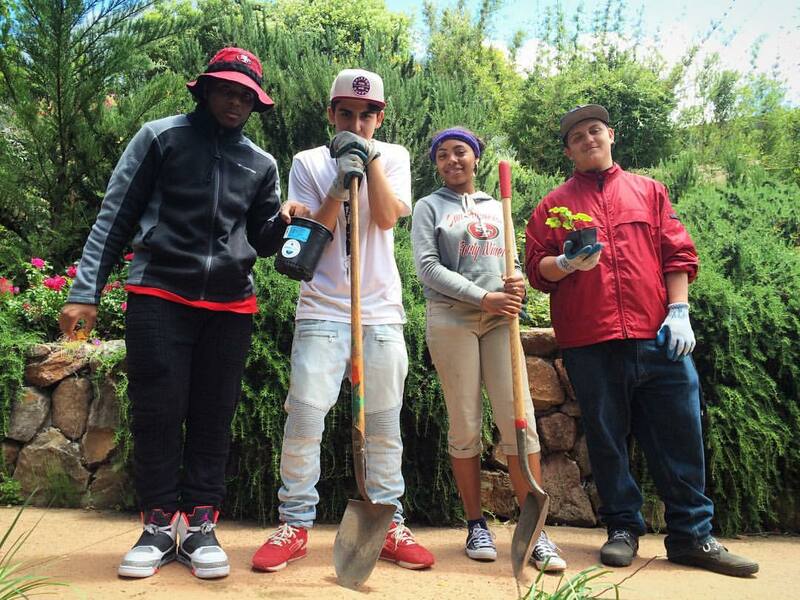 Hernan, a June Jordan School For Equity sophomore, sees the impact the garden and environmental service have made on himself and his peers. “You get time to yourself. You aren’t so focused on your phone because it’s like you’re being ‘one with nature.’ This way we can learn from each other, learn about gardening, learn about new facts and how to do new things.” Hernan says it’s been a positive experience to step out of city life for a short time. When he digs holes for a new plant, he says he feels like a new family member or a new neighbor has come into the community, and even if it’s working in a small garden, he still feels like he’s made a big difference. These hands won’t be clean for long! Getting ready to serve at San Francisco’s Visitacion Valley Greenway. Fran agrees that buildOn students have done so much. She adds, “It’s been a really valuable experience for the Greenway Project and our community to have the buildOn students here, and the staff members have been really great. In order for us to have the Greenway, our community had to promise to take care of it. Without the help of buildOn, it would make that promise really difficult to keep. They’ve really transformed it, truly.” Now, there is open space for recreational activities, pedestrian pathways linking the neighborhood, herb gardens to learn from and cook with, pollinator plants, a monarch butterfly sanctuary, and much more. In a community experiencing high poverty rates, violence, and affordable housing issues, community members and buildOn youth have united in a place of refuge to beautify and revitalize the Bay Area. When we look beyond the surface of our city’s rising skyscrapers, traffic congestion and pollution, and modern day distractions to our much deeper outdoor escapes, we will find an abundance of life hiding in the cracks, burrowing underneath the soil, buzzing above colorful flowers, and working together to build nests and hives in trees. If we’re lucky, we might find buildOn youth too. As they begin to recognize we share our home with a variety of living creatures, they begin to feel part of a larger circle of life and appreciate the importance of a healthy urban environment. Happy Earth Day! Mugging for the camera before an afternoon of planting at San Francisco’s Visitacion Valley Greenway. About the Author: Valarie Duran is a buildOn Service Learning Program Coordinator at San Francisco’s June Jordan School for Equity, where she empowers students to serve their communities with compassion, grit and optimism.